Folks, I was nervous about this one. I read, and absolutely adored, Orphan Train a few years ago. 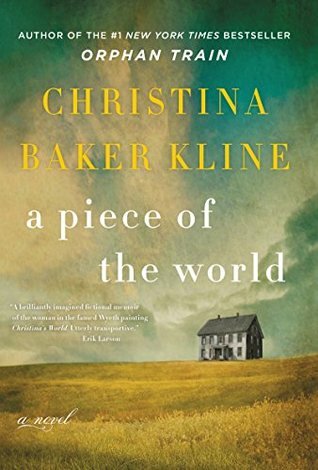 But then I had gone back and read some of Christina Baker Kline's earlier novels and my reaction was at best "meh" and, at worst, breaking out in hives. I was left with this question: had she improved as a writer or was Orphan Train a fluke? I am oh-so-thankful to say that this book was much closer in quality to Orphan Train than her earlier novels--and I just breathed a sigh of relief as I typed that. This story is based on Andrew Wyeth's painting, Christina's World, which is both beautiful and, as I've always considered it, pretty darn depressing. So, I knew going into this that it wasn't going to be a lighthearted romp. To be sure, this book did deal with Christina's limitations and her struggles, but it wasn't as dark as I had expected. Like the painting, the book paints a picture of a life that most would consider wretched, but in which the subject finds some purpose and redemption. Christina, a woman afflicted with a degenerative disease (as Baker Kline mentions in her author's note, it is believed that Christina did not suffer from polio, but from Charcot-Marie-Tooth disease), who must deal with the limitations of her physical body while also tending to her own family and their infirmities. Admittedly, she is anything but a Pollyanna, but she also exhibits a notable resolve which more than compensates for her emotional struggles. This is very much a character-driven novel . Christina is as fully-developed as a character can be and Baker Kline expertly uses Christina's voice to flesh out the supporting characters. I was especially interested in getting to know the other women in Christina's life, most of whom were people who inserted themselves into Christina's life and broke through the wall she had built around herself. Now, here is the problem. While I love character-driven books, I felt that this book was a little too character-driven. I had a pleasant enough experience reading it, but I really felt like it needed to leave Christina's head a bit more. There were times when I felt like the narration just sort of stalled and, when I came to those passages, it pulled me out of the story. Would I recommend this book? Yes, but not universally. Readers who enjoys beautiful prose and a character-driven story will have much better luck with this book than those who go in expecting a strong plot. This is the sort of book that a reader will sit with and savor rather than devour and digest.